That’s how the OED defines counterpoint, and it’s a framework I want to use to discuss Slog’s Dad. It’s a small book, of 64 pages, and it’s one constructed with a lot of musicality. I know that’s an odd term to apply to a book, but it’s one that I feel is apt. Throughout Slog’s Dad we see the left hand and the right hand working together, the text and the image, the bass and the treble, the shadow and the light. It’s a book where we go forward through image and back through text and every now and then one of them soars and tells us everything whilst the other fades into content stillness. That’s what I mean about musicality. It’s in the way this book sings. It’s singing even on the front cover (fig 1.). “I shall lift up mine eyes to the hills from whence cometh my help”. The child is exultant, holding his breath and he’s looking up and he’s caught in such, utter, hope and awe that it is breath-taking. This book is about grief. Slog’s dad is dead but he comes back. Or does he? In a way it’s never really resolved, it’s left up to the reader to decide, but what is clear in this book is that we’re always looking. Always. It’s a book about sight, about looking, about hoping that they’ll be there on the street corner as we drive by. It’s a book about memory. About reaching out and just trying to touch, but never getting far enough. And it’s a book about being earth-bound, about the fact that maybe death isn’t this finite thing, about how it could be this great, fluid thing that we fly up to and come back from and if we hold our breath and count to ten, the person we love will come back to us and we’ll be there, right there, ready to catch them. Perhaps nowhere is this more clearly illustrated in the silent pages at the heart of this book (fig 2/3). At this point we’ve become accustomed to the structure of Slog’s Dad. We have the tiniest,most crystalline of chapters book-ended by images which frame, compliment and contradict each chunk of text, and now we receive something a little different. The black and white image of fig.2 gives us the still, oppressive gloom of darkness. Sadness is always worse when it’s dark. Always. Because there’s nothing there to distract you, nobody there to talk to you, nothing happening to pull you away from your thoughts. And your thoughts can be the most terrifying place in the world. McKean is quite spectacular. Throughout the entire book he’s maintained an aerial view. That is, to say, we’ve spent a vast amount of the images looking down on the events. We spend the opening pages of the book zooming in in a breathless series that bring us from some point far away, out of this world, all the way down to a man, sat on a bench, wrapped in whiteness. In this spread, McKean engages that dramatic technique of dominance, of power, and he uses it to pull us in to what matters. The frame on the left – Slog’s lost in it. There is the empty chair, the foetal curve of the boy in the bed and shadows. Losts and lots of shadows, and they’re pulling at Slog, trying to keep him in the darkness. Everything is too big and yet, too empty all at once. The top right frame starts to pull us in. It’s started to focus. And it’s not yet stopped because this frame, important as it is, isn’t what it is all about. Not right now. And here’s where this all gets even more interesting. What is important is this tear. And it’s been there all along. It was there only if we knew where to look for it. 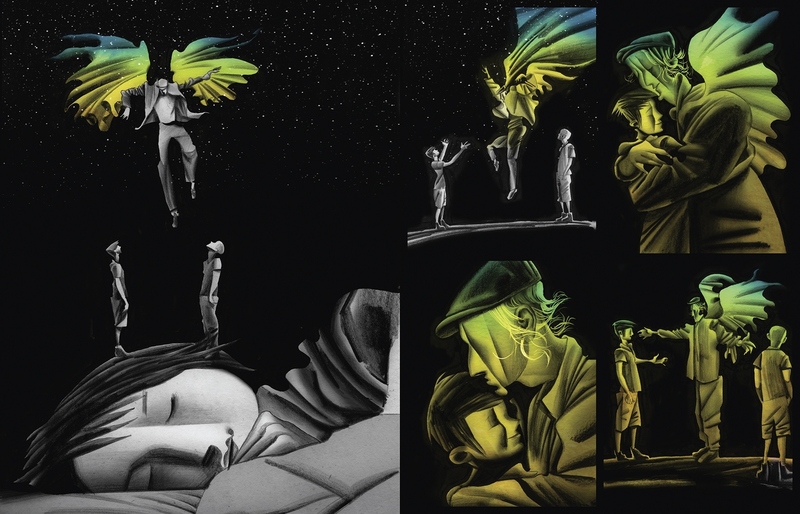 And suddenly the image on the left takes on a whole more tragic overtone; the boy crying silently in the dark that nobody notices. Not even us until we’re led to it. And have a think about the use of light in this spread too, the way the chair’s illuminated and how, just out of frame, the lights in the house are clearly still on. Think about what that suggests about what’s going on out of frame. Think about how that suggests that there’s somebody still awake in the house, probably his mother, trying to come to terms with what’s happened. Think about how that is broadening this story, making it spill out of the pages and out of the ‘book’ confines. Fig 2. is immediately followed by Fig 3. Here the aerial, downward perspective changes. We are quite literally ‘on Slog’s level’ and as such experience an immediate kinship with him. We are seeing his dream. Or his hope? His desire, maybe. Whatever it is, he’s still rooted in his lonely sleep and the events are occuring inside his mind. And oh, can I tell you how much I gasped at this the first time I read it? Because this is full of so very much. Firstly, the colours. 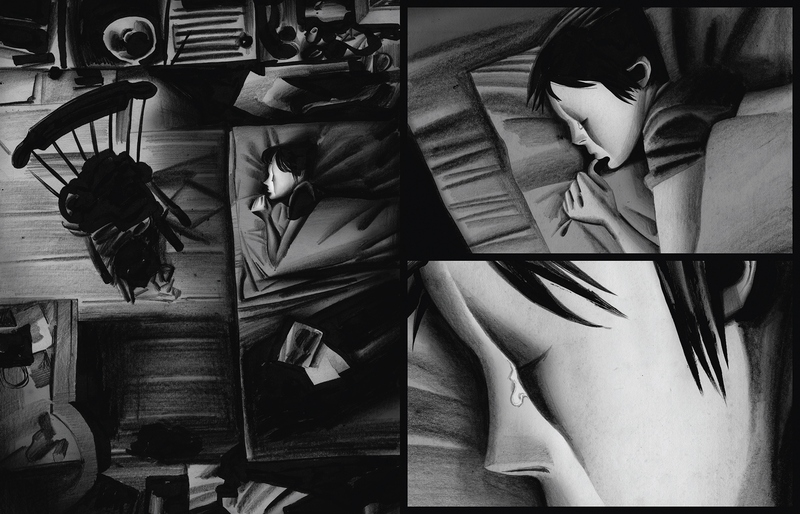 The charcoal greys and blacks that link this scene with the previous, to give us continuity and contrast to the magic occurring just up above. The strange, watery colours of the wings that are reminiscent of the Northern Lights, or of water caught in sunshine, or of a rainbow just after the heaviest of rains. His wings are full of this weirdly magical light; a light we first saw on the front cover. It’s the strangest and best of things. The sky is caught in Slog’s dads’ wings. Secondly, the boys. Davie is with Slog. And it’s Davie that catches me here because we are him. We’re watching what’s happening, turning politely away when Slog embraces his dad, placing our hands on our hips and trying to figure out what’s gone on. But in a way, whilst we are him, we’re not him at the same time. Remember when I mentioned about the aerial perspective we’ve had a lot in this book? Consider the implications of shifting straight from that into this – we were looking from Slog’s dads’ perspective and now we’re not. But consider the implications of that perspective. Slog’s Dad saw what we saw and now he’s making it all better. He has come to his boy. Whether that’s wish-fulfilment or not, is open to say, but what it is is moving. Moving and intensely emotional stuff. Where Slog is right now? We’ve all been there. All of us. 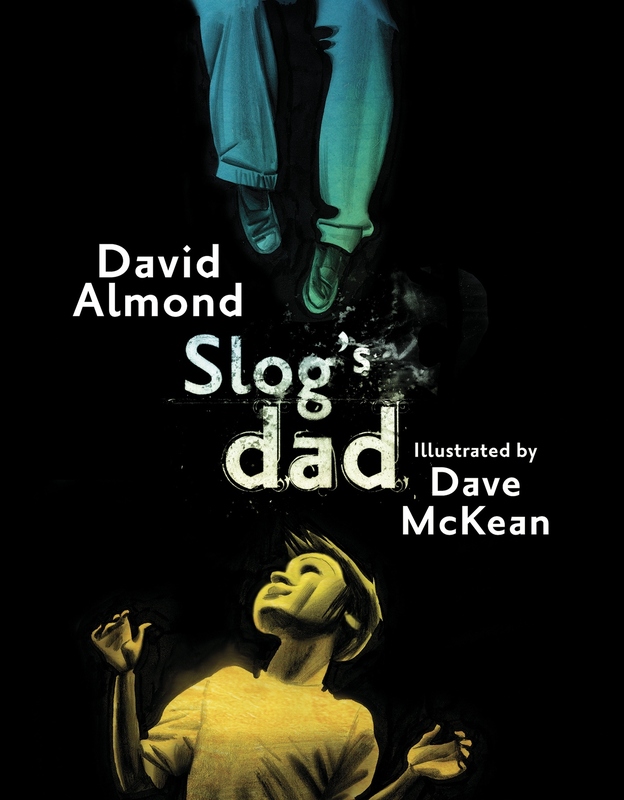 Slog’s Dad is a dark, challenging book. But the joy is in the non-confrontational nature of that challenge, the way that it’s only there if you want to be challenged, and that that challenge does not come with already given answers. Death is a darkness. But books like this help us to see the light. Pingback: Slog’s Dad : A Bereavement Counsellor’s Perspective | Did you ever stop to think and forget to start again? Pingback: Read Your Way Around the UK | Did you ever stop to think and forget to start again?